You more than anyone know the importance of sudden cardiac arrest prevention. And prevention starts with awareness and education. Here are tools to help you become an SCA prevention champion. 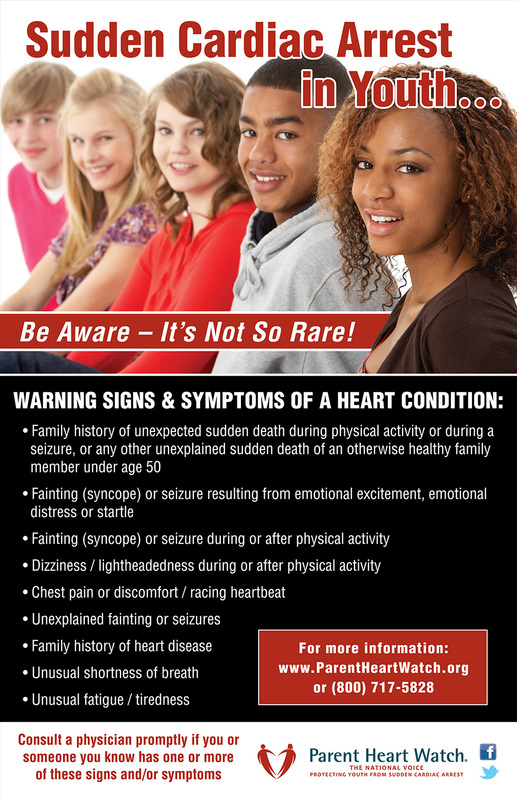 Many heart conditions have unrecognized warning signs, while others have risk factors based on family history. Help people know what to look for and when to get checked. Studies show that routine exams are not enough to detect potential heart conditions. Advocate for heart screenings that include an electrocardiogram (ECG). CPR and AEDs saves lives. To change the status quo on sudden cardiac arrest survival, more people need to learn CPR, and more AEDs need to be accessible. A well-written and practiced Cardiac Emergency Response Plan should be part of every school or youth organization’s operation. Show them how to be prepared. Follow, share and like our posts, and use your own wall or story to spread the word about SCA prevention. Get free postcards, posters and brochures for your team, school, workplace, doctor or anywhere youth congregate. Need help raising money for AEDs or other prevention activities in your community? Ask us how! Sign up to receive alerts when new content and the latest news stories are posted on Connected By Hearts. Supports groups, CPR training, associations and other resources to help you navigate your heart journey. Facebook CBH Group page and message us to join this community that is closed to the general public. Lend your heart and hands now to the hundreds of community efforts to advance SCA prevention. Keep a pulse on what’s going on to prevent the loss of young life and to advance prevention practices. When you Take the Promise, you’re linked to tools to help you champion SCA prevention in your community.